Blue carbon ecosystems are very important to many coastal communities because of the valuable benefits that they provide. In addition to their carbon storage benefits, blue carbon ecosystems also provide jobs and income to local economies, improve water quality, support healthy fisheries, and provide coastal protection. 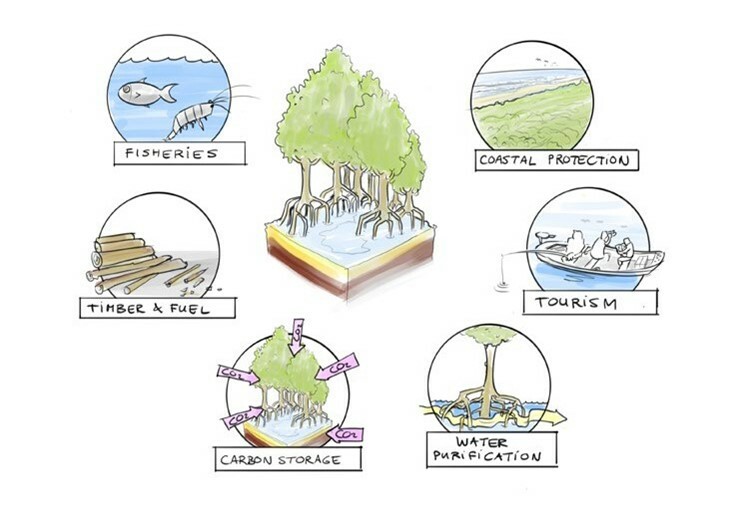 Mangroves act as natural barriers – they stabilize shorelines and reduce wave energy to reduce flood risk to coastal communities from storm surge and sea-level rise (Figure 1). Seagrass meadows trap suspended sediments in their roots which increases light attenuation, improves water quality, and reduces erosion. Coastal wetlands absorb pollutants (e.g., heavy metals, nutrients, suspended matter) thus helping to maintain water quality and prevent eutrophication. These ecosystems provide important nursery habitat and breeding grounds to support fisheries and a variety of recreational opportunities (e.g., snorkeling, recreational fishing and boating, and ecotourism). Estrada et al. (2015) assessed the economic value of carbon storage and sequestration in mangroves in southeastern Brazil and found that mean values varied based on mangrove type (e.g., 19.00 ± 10.00 US$ ha−1 yr−1 for basin forests and high intertidal to 82.28 ± 32.10 US$ ha−1 yr−1 for fringe forests and low intertidal). 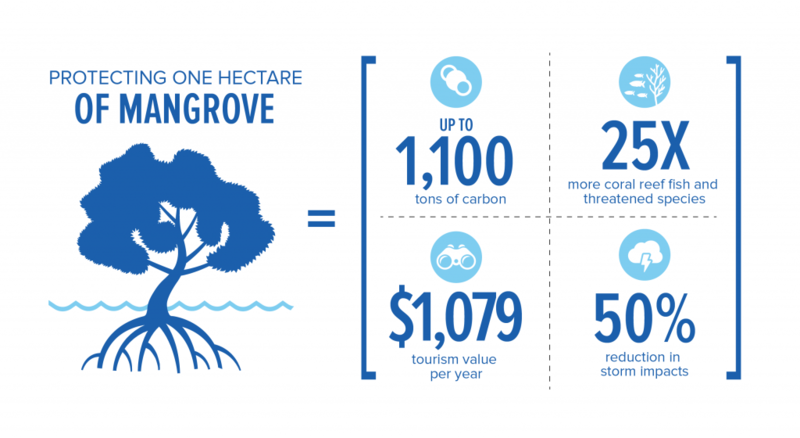 The authors estimated the total carbon sequestration value of these mangroves to be US$455,827 annually. ref See the Resources section below for additional information on the ecosystem services of blue carbon ecosystems.